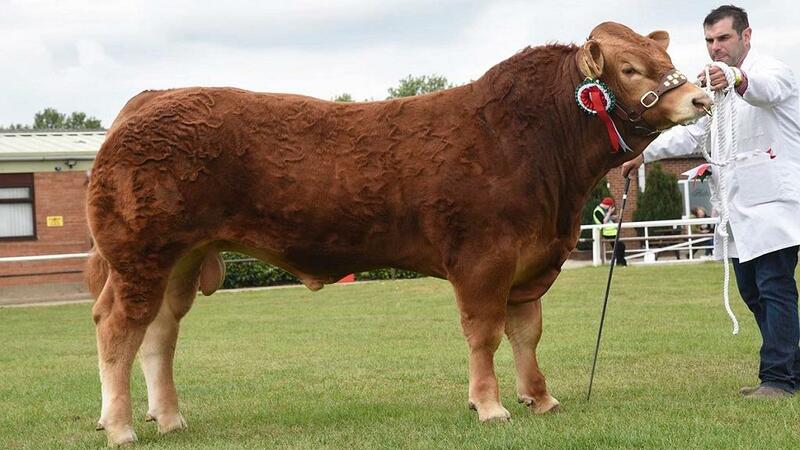 LIMOUSINS dominated the beef championships at Nottinghamshire County Show, with the supreme award going to the overall junior champion Scorboro Misterbig, a 15-month-old home-bred bull from Jim Bloom, Driffield. By his stock bull Fenomen, which is owned in partnership with Aled Edwards, Llandovery, it was making its showring debut. Scorboro Melody, a heifer by the same sire, also claimed the reserve overall junior title for Mr Bloom. Standing reserve supreme was the overall senior female champion, Burnbank Jenny, a three-year-old Limousin cow from Paul Barwood and Anita Padfield, Great Yarmouth, which was shown with its first calf by Ulm. Reserve senior champion was Witham Bank Javelin, a three-year-old home-bred British Blue bull from John and Wendy Laight, Boston. 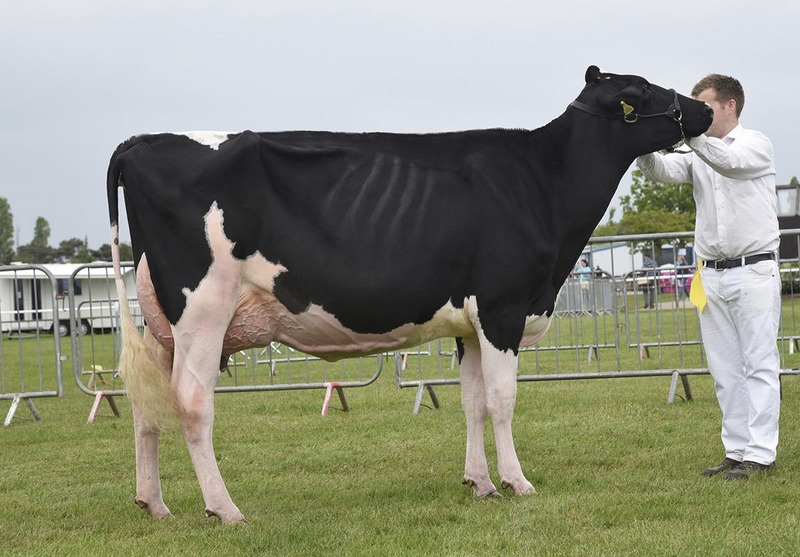 The dairy inter-breed title went to the Holstein champion, Blydale Quality Lynn, a heifer by Maple-Downs-I G W Attwood, which had been All Britain junior heifer in 2015. Having calved in December it is currently giving 34kg daily. This was the first inter-breed title with a home-bred animal for Sam and Tracey Wake, Kettering, who milk 17 Holsteins alongside their full-time jobs. Standing reserve was the Jersey champion, Design Daydream 165. The second calver was bought by Graham Armitage, Wakefield, at a sale on the island of Jersey last year, with its breeder, John James Le Feuvre retaining a half share. It calved in December and is currently giving 22kg. 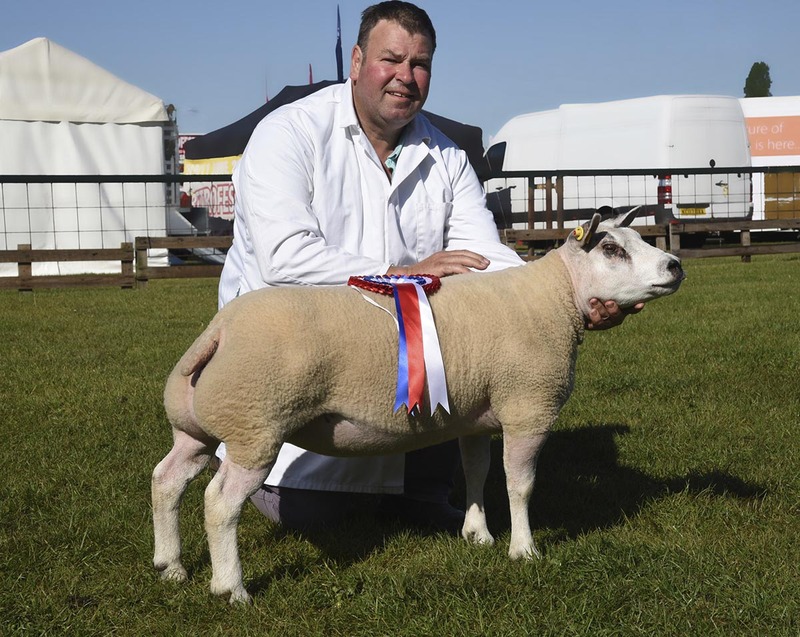 Andrew Bishop, who was showing sheep at the event for the first time, claimed the sheep inter-breed title with a home-bred Beltex shearling ewe. By a home-bred ram out of a ewe going back to the flock’s foundation female line, Mr Bishop thinks it is the best sheep he has bred. The any other continental breed champion, Knighton Slowsuck, a Rouge shearling ram from Percy Tait, Worcester, stood reserve. Out of the 2007 Royal Show inter-breed champion, it was having its first outing. 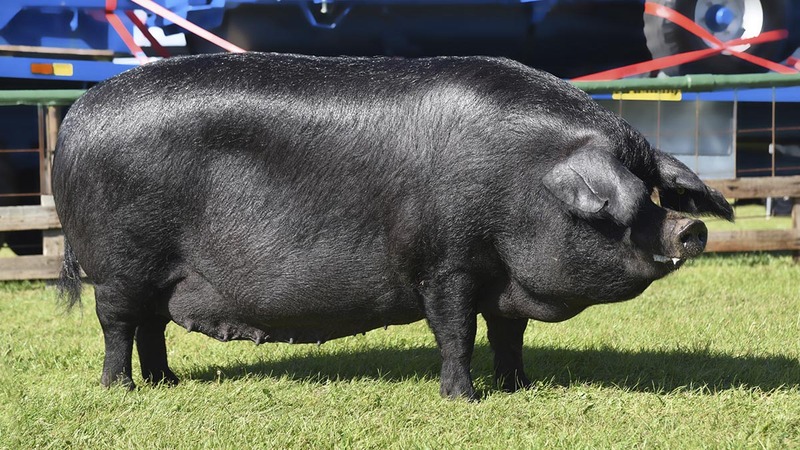 The pig inter-breed championship went to Kevin Matthews, Pickering, with his home-bred three-year-old Large Black sow, Lowpark Queen, which is a previous winner at the show and was breed champion at the Great Yorkshire show last year. Hedgerow 1 Inga 43, a Large White gilt by Sunrise Kola, claimed the reserve spot for Grace Bretherton, Kirkham. Inter-breed (Judge, D. Thornley, Derbyshire) Supreme, A.D. Bishop (Beltex); reserve, P. Tait (Rouge). Hampshire Down (P. Kettle, Lincolnshire) Sup. and fem., male and res. male, D.C. Ritchie and E.A. Halcrow; res. and res. fem., C. Cormack. Texel (F. Rushton, Derbyshire) Sup. and male and res. fem., P. Longdin; res. and fem., P. Castle; res. male, H.S. Ashley. Charolais (R. Alderson, North Yorkshire) Sup. and male and res. fem., C. Sercombe; res. and res. male, G.C. and C.J. Watson; fem., P. Tait. Beltex (S. Wilkinson, North Yorkshire) Sup. and fem., A.D. Bishop; res. and male, M. Prince; res. fem., T. J. Liverton and S.A. Carter; res. male, R. and R. Sharp. Lincoln Longwool (K. Harding, Leicestershire) Sup. and male, M.D. and J. Coney; res. and fem., S. Chapman; res. male and res. fem., L. Fairburn. Jacob (J. Dixon, Leicestershire) Sup. and male, A. and J. Smith; res. and fem., B. Cranfield; res. male and res. fem., R. Kernohan. Kerry Hill (J. Rowe, Herefordshire) Sup. and fem., male and res. male, B. Price; res. and res. fem., A. Fisher. Any other native breed (B. Enderby, Lincolnshire) Sup. and male, D. and J. Inman (Suffolk); res. and fem., R.G.T. and S.A. Banks (Oxford Down); res. male, V. Crew; res. fem., Knowles and Brown. Any other continental breed (R. Alderson, North Yorkshire) Sup. and male, P. Tait (Rouge); res. and fem., R. and R. Sharp; res. male, T.J. Liverton and S.A. Carter; res. fem., C. Cormack. Inter-breed (D. Warner, Leicestershire) Sup. and junior, J.C.G. Bloom and Son, Scorboro Misterbig (Limousin); res. and senior, P. Barwood and A. Padfield, Burnbank Jenny (Limousin); res. junior, J.C.G. Bloom and Son, Scorboro Melody (Limousin); res. senior, J. and W. Laight, Witham Bank Javelin (British Blue). Aberdeen-Angus (Mr Lawn, North Yorkshire) Sup. and fem. and sup. native, B. Marsden, Liley Evergold; res……………; male, D. and P.A. Evans, Tree Bridge Emerson, res. fem., W. Crystal and Partners, Wingate Grange Queenie; res. male, O. Tunney, Morpheus Kaiser. Lincoln Red (A. Hargreaves, Lincolnshire) Sup. and male, Nottingham Trent University, Brackenhurst Viper; res. and res. male, R. Mawer, Premier Vulcan; fem., E. Middleton, Donnington Gloria VZ; res. fem., Nottingham Trent University, Brackenhurst Miss. Hereford (L. Vesty, Hertfordshire) Sup. and male, P. English, Churchlands Estate 1 RSD Plum; res. and fem., P. English, Churchlands Estate 1 Violet; res. male, S.A. and V.J. Elwess, Elwess Parody; res. fem., J.W. and R. Johnson, Real 1 Kenny M9. Any other native breed (D. Rowbottom, Lincolnshire) Sup. and fem., C.G. Burton and Son, Riverlands Quinine (Longhorn); res. and male, C.G. Burton and Son, Riverlands Quibble (Longhorn). Simmental (C. Hollingsworth, Sheffield) Sup. and fem., P. Gunther, Fircovert Fantasy; res. and male, D. Donnelly, Ranfurly Formula 1; res. fem., P. Gunther, Fircovert Hyacinth; res. male, P. Gunther, Fircovert Gladiator. Limousin (R. Bird, Derbyshire) Sup. and male, J.C.G. Bloom and Son, Scorboro Misterbig; res. and fem, P. Barwood and A. Padfield, Burnbank Jenny; res. male, P. Barwood and A. Padfield, Trisant Loosecannon; res. fem., J.C.G. Bloom and Son., Scorboro Melody. British Blue (G. Robinson, Nottinghamshire) Sup. and male, J. and W. Laight, Witham Bank Javelin; res. and fem., J. and W. Laight, Witham Bank Jade; res. male, L. Todd, Torrington King Hugo; res. fem., Beckside Blues, Ridge Dean Jaeger. Commercial (D. Wright, Lincolnshire) Sup. and fem., P.S. Sellers, Black Pearl; res. and res. fem., T.A. Lyon, Sweet Cheeks; male, Beckside Blues, Colonel Mustard; res., T.A. Lyon, Paco-Robanne. Inter-breed (M. Nutsford, Cheshire) Sup., S. and T. Wake, Blydale Quality Lynn (Holstein); res., G. Armitage, Design Daydream 165 (Jersey). Holstein (H. Crapper, Derbyshire) S. and T. Wake, Blydale Quality Lynn; res., P. Mellors, Cricketfield Spectum Rae. Jersey (J. Stubbs, Derbyshire) Sup., G. Armitage, Design Daydream 165; res., Barnowl Jerseys, Barnowl Miles Shammy. Dexter (M. Kay, Cumbria) Sup. and male, Cattle Keeper, Llan-Y-coed-Llewellyn; res. and fem., Cattle Keeper, Linford Mustard; res. fem., H. Atterbury, Stowfield Millie. Inter-breed (B. Mulken, Lancashire) Sup., K. Matthews, Lowpark Queen (Large Black); res., G. Bretherton, Hedgerow 1 Inga 43 (Landrace). Traditional breeds (J. Brett, Derby) male, Maerose Traditional Berkshire Pigs, Maerose Peter Lad 383 (Berkshire); res. male, M. Hicks, Windmill Rufus (Gloucester Old Spot); fem., E. Paddock, Lewin Dorothy 28 (Middle White); res. fem., M. Hicks, Windmill Star (Gloucester Old Spot). Modern breeds (W. Gregory, North Yorkshire) fem., G. Bretherton, Hedgerow 1 Inga 43 (Landrace); res. fem., C. and G. Gillick, Oak Tree Catalina (Large White); male, S.J. Booth, Chapel Royal Thrk 10 (Large White); res. male, J. Knaggs and D. Brentnall, Little Owls Hulk 047 (Duroc).